Today I've got some crazy news! We have created a super shoot-em-up indie deal with our friends from 2AwesomeStudios. 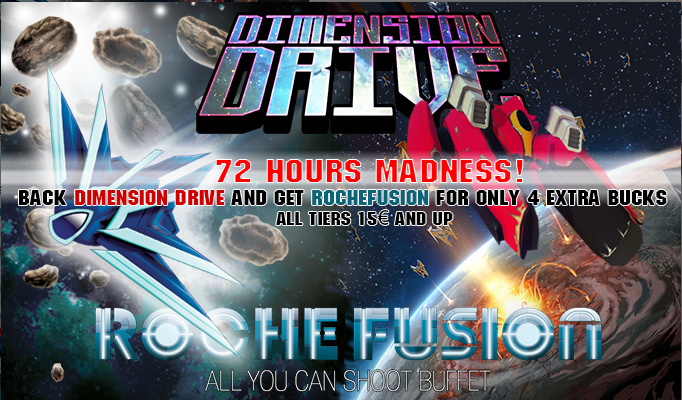 For a limited time of only 72 hours, if you back their Kickstarter for the awesome Dimension Drive, you can get a copy of Roche Fusion for just €4 extra! Head on over and take a look, and make sure to tell all your friends! This is the perfect opportunity to pick up Roche Fusion if you haven't yet, or to pick it up for a friend. Since Roche Fusion is already out and about, everyone who gets the deal will get Roche Fusion right after the Kickstarter succeeds! In addition, we will release our first FREE content update right after the Kickstarter as well! Among new ships, bosses, upgrades and more we are including an upgrade that we shamelessly stole from Dimension Drive: The... Dimension Drive! So, head on over to the Dimension Drive Kickstarter page and get yourself some of that sweet deal, before it is too late!